On Wednesday night, Levi Strauss disrupted fast fashion by unveiling its Eureka Innovation Lab with the launch of Dockers Wellthread, a product development process and men’s line that puts at the front sustainable design, environmental stewardship, and worker wellbeing. Apparel and sustainability influencers rubbed elbows at family style dinner surrounded by the Lab’s sewing machines and rolls of fabric. The evening featured a panel presentation by Wellthread’s inventor, Paul Dillinger, Senior Director of Color, Concept and Design at Dockers, and Michael Kobori, Levi’s Vice President of Sustainability. Kellie McElhaney, Faculty Director of UC Berkeley’s Center for Responsible Business moderated, fielding questions about Wellthread’s development, its scalability, and what it means for fast fashion. Dillinger held the stage with panache, describing how he came to Wellthread to solve the challenge of developing an integrative systems approach that incorporated at the outset Levi’s values, quality, sustainability, and social restoration, and asked at each decision is this “the right thing” to do. Ecouterre scooped the launch – getting a first look at Wellthread’s debut collection and speaking with Dillinger about the process. Dillinger developed Wellthread while with the Aspen Institute’s First Movers Fellowship, as its first apparel designer. After seeing the pilot, Levi’s green-lighted the concept and incubated Wellthread at the Eureka Innovation Lab, letting Dillinger run project like a startup. Dillinger says that the simple mantra “what is the right thing?” guided the decisions at each step and led Dillinger to make an unusual move in fashion design: partnering with Dockers® suppliers at the design stage. 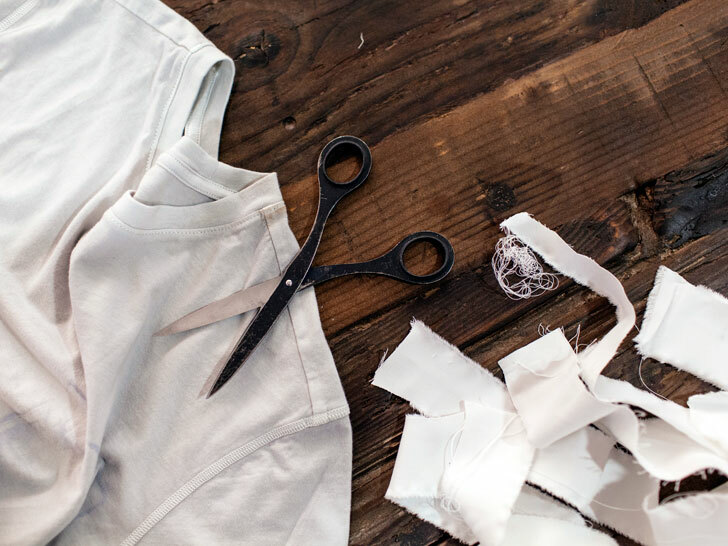 It seems common sense Dillinger said to include the people who have the technical expertise about how the garment is made in the design process, but this is not the industry norm. The Wellthread collaboration yielded unexpected results. Dillinger’s idea of making khakis durable with a long, sewn, reinforced strip was ditched when a supplier dusted off a double-stich machine and created a pant component with the same tencel strength as the reinforced strip. Wellthread and its line emerged from the collaboration, embodying its ethos of “doing the right thing” at each step of the product development. The line’s first collection features bright men’s American heritage classics made with the durability and quality that first drew customers to the brand 25 years ago. The pieces are 100% cotton and their sundries are made of compressed cotton and metal that can be extracted with a magnet. They are dyed using a specialized sustainable garment-dyeing system that reduces water and energy consumption. It uses cold-water pigment dyes for tops and salt-free reactive dyes for pants and jackets. Also, Wellthread dyed-to-order its garments in the factories, not in the mill, which provided more flexibility and reduces waste. Also, post-Rana, Dillinger chose to manufacture exclusively at a Bangladeshi factory participating in Levi’s factory pilot program, Improving Workers’ Well-Being. As he later told Terre, Levi’s could have steered away from Bangladesh given the media scrutiny, but it decided instead to foster factory and Levi’s funded programs aimed at improving the factory workers’ lives. Dillinger and the team also looked ahead. While recycling cotton is uncommon, the Wellthread team developed a long-staple cotton yarn for its twill, which can be more easily recycled. 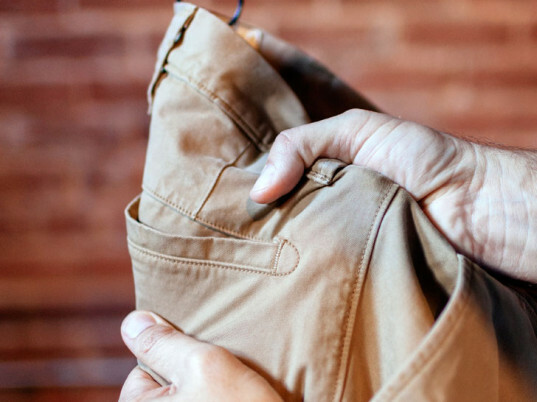 To reduce energy from line drying and the garment’s wear, the team included care instructions to wash with cold water and a locker loop on khakis to promote drying them by line. Paul, could you tell Ecouterre’s readers about the challenge you took on that led to Wellthread? The challenge was that although there are all sorts of great initiatives going on that address the recalibration of one component of a garment, or process, or design or a business model, the idea of a systems-based approached hadn’t really been tested. It is only through consideration of every component and its impact, every component, and its potential value and benefit that you get a view at the opportunity for creating positive change. During dinner we were talking and I asked you if you had any “ah-Ha moments” during Wellthread’s development. Can you talk about the “ah-ha moment” that you experienced? The “ah-ha moment” was as we trying to unthread the complexity of the process, a really simple mantra came forward. What we were really doing fundamentally is understanding that at each decision point there is an opportunity to do the right thing or the wrong thing. So often in business, especially in the apparel business, we get caught up in a lot of externalities, a lot of influences that kind of make us question what decision to make. If we give ourselves permission, the authority to simply do the right thing at every decision point, then we will generate value, we will stop creating negative environmental impact, and start creating positive social impact. Just do the right thing whenever you have the choice. And that real simple mantra around a really complex industry . . . It also saves time. You don’t spend time worrying about what the right course of action is. Just do the right thing and the right course of action will become evident. We did this without a cost of goods target. We just did the right thing all the way across the process. Whenever we had a choice we tried to choose the right thing. That yielded profitability. It allowed us to bring our retail price points down 30% year over year. In doing so, really generating a lot of profit and generating very little waste. By questioning what the right thing was that’s what allowed us to eliminate salt from our dyeing process. That is what allowed us to bring all of our production into facilities where we are engaged in creating social value. If we know that we can’t make a sweater at the highest level of social and environmental responsibility, don’t make a sweater. Make a sweatshirt that feels like a sweater. Make a cardigan out of plush fleece that has the same values of a sweater and you do it in a way that is responsible. You know, “stop making messes.” That is a simple mantra that we adopted. With the tragedies from the factory fires in Rana, there is now a lot of attention on factory conditions. Can you talk about Levi’s pilot program to improve workers lives in its suppliers’ factories? Levi Strauss has held a leading position in the [apparel] industry for about twenty-two years on the issue of terms of engagement and fair labor practices, and environmental stewardship in the factories where our are goods are made. Recently, we have launched this pilot program that sought not just to create fair labor and environmental practices in the factory, but also sought to generate social value outside the factory. To create factory and company funded programs in the communities where we were active that took into account the needs of the workers. That took into account the needs of the workers, that delivered services to the workers. That asked what they needed and allocated our resources in service of the factory-worker asserted need. One of those factories happens to be in Bangladesh. Now we have the opportunity with all of the tragedy in Bangladesh brought the issues of factory safety into the headlines, we had the opportunity to steer away. We said “No. We are already engaged in this project. We are already working to develop community value in this one pilot program in Bangladesh. Let’s use this as a platform to shine the light on the potential for transformative, positive social value that the apparel industry can create when it engages responsibly around the world. Let’s take this opportunity to say ‘there is another side of the story. There is a restorative, responsible, values guided conversation that we can participate in. And we can show that a responsible apparel [company] can fix some of the harms that an irresponsible industry has heretofore created. On a last note, you spoke about the culture of the “abundance of things.” Where do you place Wellthread, and Levi’s, within this existing “abundance of things” context and the shift that you see coming to the culture? Well, I see that in material culture, with the proliferation of objects and the ease of manufacture, too many things have been made too cheaply, too many things have been made poorly. So we have become addicted to the satisfaction of purchase. In doing so, we have numbed ourselves to the appreciation of the quality of the object we’ve purchased. It’s like a sugar fix. We get that quick high from that quick purchase, but we don’t celebrate the evolution of the garment over time. We have great pairs of Levi’s in our archive that are wearable garments, durable garments, as cool looking today as they were 130 years ago when they were first made and sold. If we use that as a North Star and use that as guidance for our activity and really practice quality making of things, it will guide us toward making fewer things. They will be more expensive, but they will be far more valuable. That is really what we are doing. Trying to take a company that has values and using those values as a component of the value of an object. So that you buy an object and you know that it celebrates the community of makers, the fields where it was grown, the process by which it was made, that if you care for it well it will last a lifetime. It is that lifetime of engagement that we are hoping to create with our product. 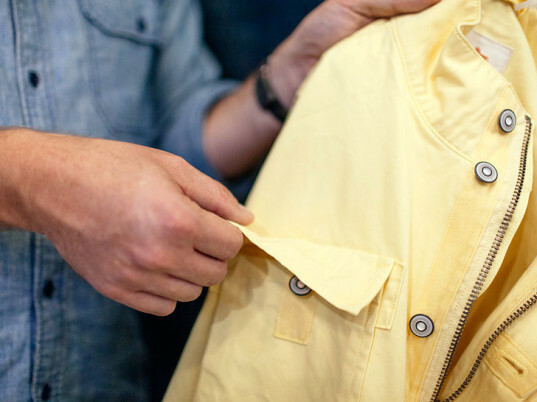 On Wednesday night, Levi Strauss disrupted fast fashion by unveiling its Eureka Innovation Lab with the launch of Dockers Wellthread, a product development process and men�s line that puts at the front sustainable design, environmental stewardship, and worker wellbeing. Apparel and sustainability influencers rubbed elbows at family style dinner surrounded by the Lab�s sewing machines and rolls of fabric. The evening featured a panel presentation by Wellthread�s inventor, Paul Dillinger, Senior Director of Color, Concept and Design at Dockers, and Michael Kobori, Levi�s Vice President of Sustainability. Kellie McElhaney, Faculty Director of UC Berkeley�s Center for Responsible Business moderated, fielding questions about Wellthread�s development, its scalability, and what it means for fast fashion. Dillinger held the stage with panache, describing how he came to Wellthread to solve the challenge of developing an integrative systems approach that incorporated at the outset Levi�s values, quality, sustainability, and social restoration, and asked at each decision is this �the right thing� to do. Ecouterre scooped the launch � getting a first look at Wellthread�s debut collection and speaking with Dillinger about the process.